Earlier this week, I started an up 'close and personal' tour of our garden area. Today, we continue our lazy walk around my small(ish) backyard. If you were really here? I would offer you a cold adult beverage. Do you prefer white or red sangria? Today, we're at the back of the garden. The back of the garden is tricky for a few reasons. First, it's where our backyard begins a verrry precipitous drop-off, so plants must..........not be lean-y. Second, the back of the garden is under TWO Norway maple trees. *****Norway Maple Aside*********Norway Maples are an invasive species in New England. Their canopy of leaves is SOOOO dense as to pretty much prohibit anything native from growing underneath. The soil under a Norway maple is PARCHED because very little water trickles through the dense canopy. Third (remember, we are counting reasons why I have backyard drama), the sun passes OVER the Norway maples in late afternoon and shines it's hottest sun on the SAME plants that must tolerate shade and dry soil. So the back of the garden is a work in progress. The only plants that have thrived? 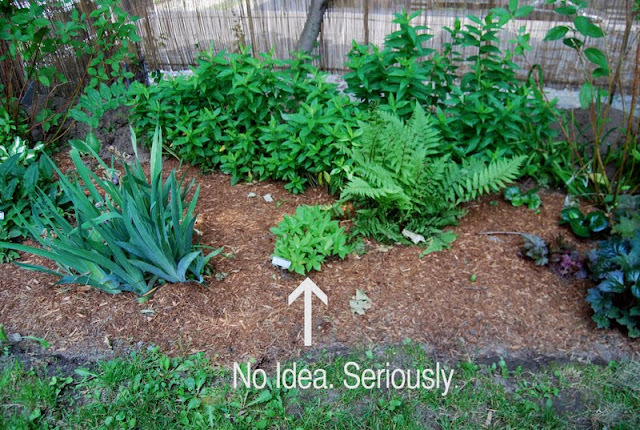 Ballsy phlox, one stubborn fern, and something else that I didn't mark and don't remember. Boy! You finished that sangria FAST! Ready for a refill? Your e-sangria was such a tease ;) Fun romp through your backyard, mystery plants and all! I always learn something at your blog... first, a lot about Norway Maples, and also that there are different colors of sangria! I like mine with bits of fruit in it. white... yes, refill. no idea what that is, but it looks nice! dude, if there is any way to do it, you should try to get rid of those trees. i have had SERIOUS run-ins with norway maples, and it is true that they are FROM HELL. oh, i wish you you could have seen me pulling hundreds of norway maple seedlings out of my backyard. think that broom scene from fantasia. we have been able to remove several from our yard, as well as convince abutting neighbors to do the same. offering to pay works really well. i am pro-tree, but anti-invasion. Well what have you tried so far? 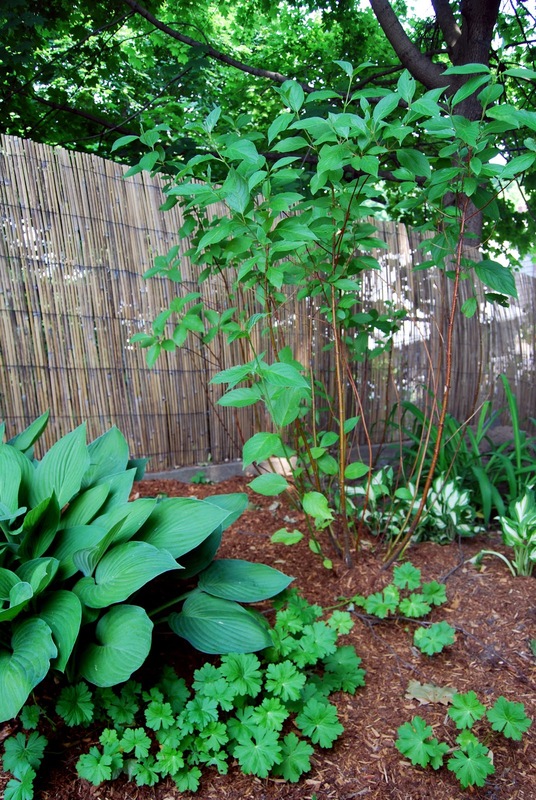 I'd try some dry part shade plants that can also handle full sun like daylilies, lamium, snowdrops, ajuga (I have 'Toffee Chip' and it has beautiful foliage and flowers yet doesn't spread too much), solomon's seal, virgina bluebells, wild or european ginger, variegated sedges, wood/male/female/ostrich fern, Christmas fern is the most dry tolerant fern, dwarf oakleaf hydrangea, dwarf snowberry/coralberry, and dwarf conifers (will grow in horrible soil conditions and like bright part sun, tsuga canadensis or abies koreana or taxus cuspidata would be perfect). I'm really enjoying seeing your garden tour! I'm in the middle of designing a shade border for my own garden and it's also under some thirsty trees so I feel your pain. Looks like you've got lots of great ideas! 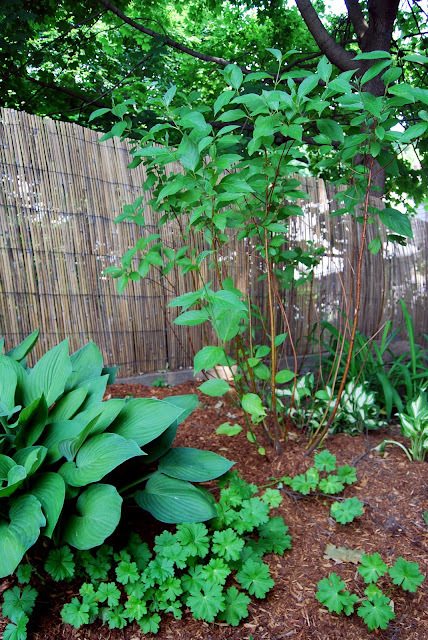 I'd also add foxgloves if you like them -- I have them growing under the eaves on the northwest side of my house -- we're talking dry dry dry shade except for the blasting late afternoon sun. And they just keep spreading and spreading as happy as can be. I love them. Oh yes, and that little plant you don't know -- is it possibly sweet woodruff? That's my best guess without seeing a bigger picture.